Why The House of Sound and Story? I’ve been working on a project for the past year or so called Seeing Sound. I’ve been creating innovative soundscapes now for a long time. My pieces are featured in sound art festivals, on the radio and various places on the internet. I’ve been thinking about all the film festivals out there. I’ve watched the growth of Youtube. And I’ve been wondering how to get my productions into art galleries. And I am always surprised when people say that they’re uncomfortable just listening to something for 5-10 minutes and having nothing to focus on visually. What I realized that I needed to do was work out a way to add images to my sound pieces. The challenge is that I need to find images that support the sound I’ve created. For me, the sound composition comes first. It’s the opposite with a lot of video producers I know. They start with the picture and add the sound afterwards. I also want a balance between the visuals and the sound so that no element dominates (oh alright .. I admit it. I want them to walk out saying “Wow. That sound was amazing.”) I want them to like the images but I want them to love the sound story. So my challenge is, how to create a visual element in a way that the pictures support the sound. The images can’t dominate, but they need to be striking, compelling and the kind that people remember. And strong from a technical perspective. Fortunately, I have an excellent video artist and photographer working with me. Stefan Rose, I’m so glad you’re with me on this journey. And thanks to the Ontario Arts Council Media Arts Section for providing the funding for this project. Here is the first of the three pieces I am working with — it’s called No Time for Silence, composed for CBC Radio in 2001. It’s about the contrast between the natural rhythms of life, and the forced un-natural rhythms we march to in so much of our daily life. I’ve been recording conversations with Stefan and I about the process of marrying images with sound. I’ll share those in upcoming weeks too, along with the two other pieces we’re working with. Okay, so yes. I’ll start out by acknowledging that Marriages of Convenience can sometimes work. And built in microphones in cameras can sometimes work too. But for the most part — an external microphone is always the better bet. In the next few articles, I’ll talk about the various kinds of techniques and gear that video makers can use to get good sound. To begin with, some words about those built ins and why they’re not the best idea. Stand the same distance from the person you’re going to be shooting. Ask them to talk. Close your eyes. What do you hear? If you’re no more than a foot away, you’ll likely hear the person pretty clearly. Step back about four feet. a) the person’s voice. I had to strain because her voice was very soft. Some of the words were lost. b) the ventilation system in the room. c) the person sitting next to me coughed. It was loud. d) And then an ambulance went by. Built in camera mikes will pick up all of that sound. They are what are called “omni directional” microphones. Which means, they record everything they hear, at the same sound levels as your ears are hearing. a) the main speaker. But she was very soft. I could hear her most of the time, but I was straining. b) the sound of the constant furnace, which also masked the sound of my speaker. c) the cough. Really loud. Ouch. My ears hurt. d) and then the ambulance sound, which masked the cough, the furnace and my speaker. Many video makers I talk to say that sound is one of their biggest frustrations. But it doesn’t have to be. There are many easy ways to get good quality sound from the get go, and make it sparkle in post. Over the next few weeks, I’ll be doing series of posts about Getting Good Sound for Video. Next in the series, choosing the right kind of microphone. You might not have heard of George Groves before. Sound people are like that. Always in the background. (That is, until they stop the action on set because they can hear a truck roaring by in the background). 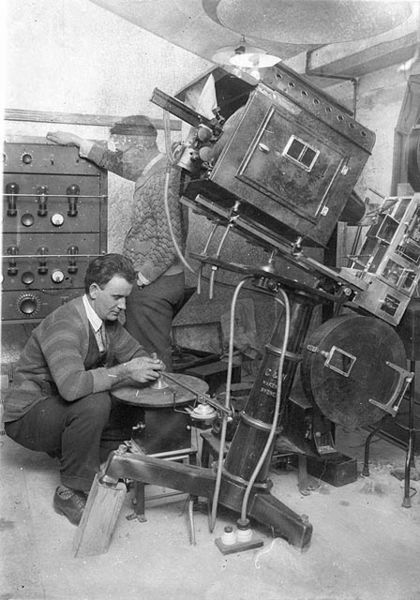 George Groves is credited with being the first person to figure out how to synch sound with film. The year was 1926. The film was Don Juan. (Incidentally, the film also has the distinction of containing the most kisses from the most characters of all time. 191 different women. That’s a lot of kissing) It was primitive – essentially, George recorded a record album with an orchestra of 107 musicians, timed to exact scene changes in the film. Essentially, they synched the sound on film by needle dropping at precisely the right moment when the film started. And they let it play until the end. And of course, most people know that the next major development was the first “talkie”, The Jazz Singer, starring Al Jolson in 1927. Not much kissing in that one because the actors were too busy using their lips to speak words. Audiences were spellbound. Again, in the words of George Groves – “Everybody held their breath…It took everybody by storm that he just came out with spoken words”. So why did it take so long for sound and images to synch up? It’s essentially because getting good sound and good images require different sets of equipment that are not really compatible. The solution these days is to buy a camera that has a built in microphone. But even then, these microphones and cameras don’t always live happily together. In the next couple of posts, we’ll explore some techniques to synch up good sound and good pictures. It’s surprising how many of these techniques are the very same as those early film producers way back in those early days of film. By appointment or by chance. Email us!